David Farren is skilled at capturing life and movement in vibrant cityscapes. 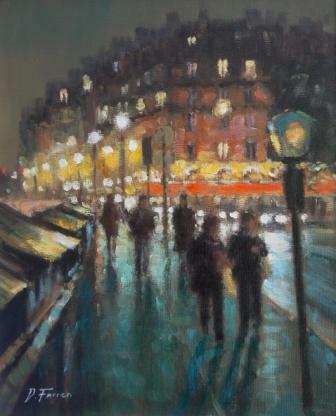 ''Night Walk Along the Seine'' is full of atmosphere. A wet pavement reflects the colour and light in the scene and dramatic shadows make the cityscape shimmer with energy and life. David Farren uses careful brushwork and colour to represent the energy and movement of the urban landscape. His aim is to capture the ambience of the city streets he observes. Farren produces his high-impact images in acrylic and oils, enjoying the immediacy and versatility of both mediums which he finds particularly well-suited to his direct, impressionistic and expressive style of painting. In addition to Red Rag Modern Art Gallery David Farren has exhibited at other leading British Art Galleries. Each painting at Red Rag is sourced from the David Farren artist studio and like all Red Rag British art and Modern art it can be shipped worldwide.